Adding a New Back Door Entrance | 41 Lumber - Serving Iron Mountain and the U.P. Almost all homes have at least two entrances: typically, the main entrance (front door) and a backdoor. Multiple entrances and exits are important for both convenience and safety. In some instances, it may be necessary to install a new backdoor entrance. This could be because of a remodel that has taken place inside, where the doorway must be moved; or an improvement has been done on the outside such as a deck or patio. In some cases, the existing backdoor just needs to be expanded, like with sliding glass doors, etc. The reasons for adding a new backdoor entrance can obviously be many. If you are thinking of moving or expanding your backdoor entrance, you should make the most of it. For example, consider adding a mud room to your design. This will be an ideal transition room between the outside and inside. In it, you could also include a bench, plenty of hooks or racks for hanging clothes, cubbies for shoes, and a durable, easy to clean floor. Consider how often the back door will be used. If it is closer to where the cars are parked for example, then the chances are, this doorway will get a lot of use. Be sure to allow space inside to accommodate a higher rate of traffic and the baggage that comes along with it. If a large part of your decision to add or improve your backdoor entrance has to do with the layout outdoors, then perhaps a more open and less utilitarian approach should be used. There are many backdoor options available for this. Sliding glass doors (especially pocketed styles) are perfect for situations where there is limited space inside the home. Hinged doors are another option, though if space is an issue, be sure that they swing outwardly. In either situation, remember the screens! 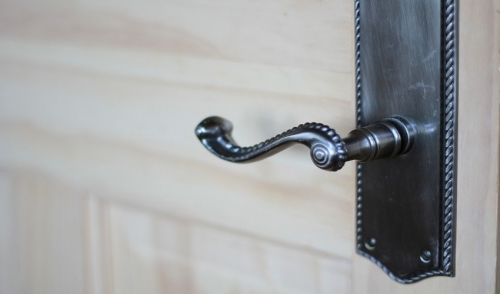 One old-world design that is becoming new again is the stable door. This is the perfect application for the backdoor, especially if attached to the kitchen. A stable door is a single door that comes in two halves. That way, it can serve as a standard secure backdoor; or the top half can be opened independently, allowing fresh air inside while keeping children and pets secure. Something to keep in mind when installing a new backdoor entrance is, that a secure backdoor can be even more important than a secure front door. Recent crime statistics show that a majority of burglars look to the backdoor as their entrance of choice. This is because typically, the back door is less secure than the front, and they know it. Luckily, there now are many quality choices available that are every bit as secure as your home’s main entrance. To see the variety of door choices that are available, stop in and our knowledgeable staff will be glad to go over all of the options with you. For any of the other supplies and advice that can help make this project successful, we’ll be happy to help with that too.